Yes, it's another local eatery post. We wouldn't mention it, if it wasn't worth eating there (really!). Most people don't know where to eat, when they're done strolling the Carmel market. That's why we want to open up this 'hidden world', the Yemen Quarter, for some outlanders. 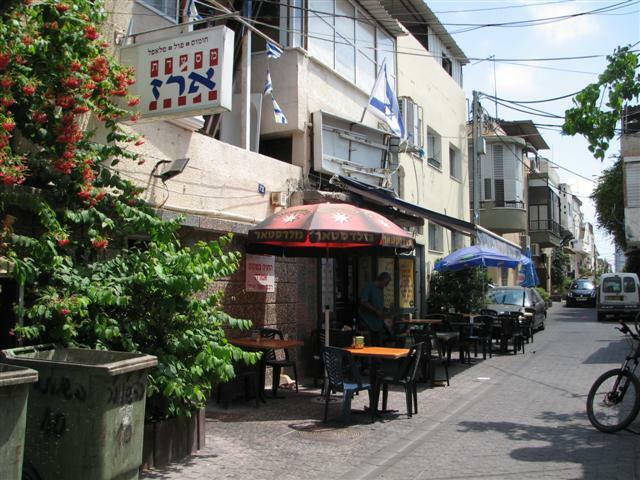 Erez is not the only good place in this picturesque neighborhood, but they have a vast variety of food and it's all so good and cheap! 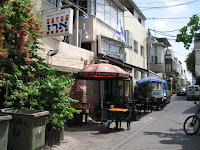 They have the usual hummus dishes, skewers and Yemenite soup meals (but for the real soup experience, stop by at Rina and Zchariah). But what we loved is the schnitzel dish and believe us, a good and affordable fresh schnitzel is hard to find. It's a simple dish: deep fried breadcrumb coated schnitzel and 3 side dishes. You can choose from: humnus, fries, white beans, green beans, rice, tehina or a chopped Israeli salad. Great value! It's recommended to come either before 12pm or after 1.30pm, if you don't want to stand in line for a seat.